Sunderland earned only their second away point of the season, holding Aston Villa to a goalless draw at Villa Park. Villa went close when striker Christian Benteke steered a shot high when well placed, before Sunderland were denied a penalty for a Ciaran Clark handball. The visitors had a glorious chance to take the lead but Emanuele Giaccherini sent a shot from four yards over. Sunderland again gave Villa a scare when Fabio Borini headed Giaccherini's cross against the bar. The Black Cats had lost their last five top-flight games on their travels but were well-organised and determined as they provided manager Gus Poyet with his first away point since he became their manager on 8 October. The Wearside club moved off the bottom at Crystal Palace's expense but are five points from safety. Villa were being watched by their most famous fan in Prince William, but the Midlands side could not find a way past a Sunderland defence expertly marshalled by John O'Shea and Wes Brown. "For the first time since August, Sunderland return with something from their travels. They could have won it, as they had the best chance, but neither team did enough to win." The hosts have a better record away than at home in the Premier League but began with an intent which suggested otherwise. There was a high tempo and open feel to the match early on, although both sets of players lacked composure, epitomised when Benteke missed a good chance. The Belgian had the goal in his sights when Ashley Westwood laid off a Karim El Ahmadi pull-back, but Benteke steered his side-footed effort just over. He has now gone seven games with a goal for his club. Sunderland became more of a threat as the game progressed and had a strong shout for a penalty when Sebastian Larsson's free-kick was headed across the area by O'Shea and the ball appeared to strike the arm of Villa defender Clark. The Black Cats were aggrieved at referee Neil Swarbrick's decision but the visitors only had themselves to blame when they failed to take the lead minutes later. A Ki Sung-Yueng cross was knocked back across goal to Giaccherini, who side-footed over from point-blank range. The Italian midfielder almost made amends for his miss when he crossed for Borini, whose glanced header came back off the Villa bar. "It was not a classic but if you can't win a game then don't lose it. "It is another clean sheet and we had some lads back from injury who got some match time under their belts. "We never deserved to win the game." "It is a good point for different reasons. We performed for 90 minutes, we made it difficult for Villa and created chances. "We had a miss from two yards and hit the crossbar. Sometimes you have to understand when you are at the bottom that things don't go for you. "I think we deserved the win. The players were believing. We didn't get the three points but it is a step in the right direction. "The idea is to maintain this level and I am sure we are going to be all right." For a gallery of photos from Saturday's Premier League games, visit the BBC Sport Facebook page. Match ends, Aston Villa 0, Sunderland 0. Second Half ends, Aston Villa 0, Sunderland 0. Phillip Bardsley (Sunderland) is shown the yellow card for a bad foul. Ciaran Clark (Aston Villa) wins a free kick in the defensive half. Foul by Phillip Bardsley (Sunderland). Gabriel Agbonlahor (Aston Villa) is shown the yellow card for a bad foul. Phillip Bardsley (Sunderland) wins a free kick in the defensive half. Offside, Sunderland. Vito Mannone tries a through ball, but Steven Fletcher is caught offside. Gabriel Agbonlahor (Aston Villa) wins a free kick in the defensive half. Offside, Aston Villa. Brad Guzan tries a through ball, but Gabriel Agbonlahor is caught offside. Substitution, Aston Villa. Libor Kozák replaces Christian Benteke. Attempt missed. Fabian Delph (Aston Villa) left footed shot from long range on the left is high and wide to the left. Assisted by Ashley Westwood. Offside, Sunderland. Sebastian Larsson tries a through ball, but Steven Fletcher is caught offside. Substitution, Sunderland. Ondrej Celustka replaces Andrea Dossena. Foul by Steven Fletcher (Sunderland). Attempt saved. Aleksandar Tonev (Aston Villa) right footed shot from outside the box is saved in the bottom left corner. Assisted by Antonio Luna. Gabriel Agbonlahor (Aston Villa) wins a free kick in the attacking half. Substitution, Sunderland. Jack Colback replaces Craig Gardner. Corner, Aston Villa. Conceded by Phillip Bardsley. Foul by Aleksandar Tonev (Aston Villa). Ki Sung-Yueng (Sunderland) wins a free kick in the attacking half. Substitution, Aston Villa. Aleksandar Tonev replaces Karim El Ahmadi. Substitution, Aston Villa. Marc Albrighton replaces Andreas Weimann. Corner, Sunderland. Conceded by Ciaran Clark. Attempt saved. Fabio Borini (Sunderland) header from the centre of the box is saved in the top centre of the goal. Assisted by Emanuele Giaccherini with a cross. 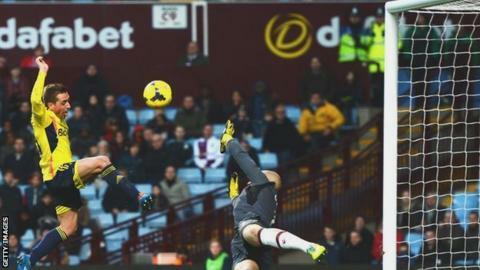 Foul by Christian Benteke (Aston Villa). John O'Shea (Sunderland) wins a free kick in the defensive half. Antonio Luna (Aston Villa) wins a free kick in the defensive half. Foul by Fabio Borini (Sunderland). Andrea Dossena (Sunderland) wins a free kick in the defensive half.